HOW WILL MY ICE CREAM BE DELIVERED? FedEx Ground. In addition to the six (6) Ice Cream Club® pints, the package will contain dry ice. Warning: Do NOT touch dry ice with bear hands. Dry ice will burn skin. Use gloves or other protective material to remove dry ice from container. Immediately upon receipt please get The Ice Cream Club® pints into a freezer. Dry ice will make the package colder than your home freezer, so you will need to temper the ice cream in your freezer in order to scoop the ice cream. If you are surprising someone with a gift, we recommend you confirm that someone will be able to receive the package and place in a freezer the day of delivery. No need to ruin a surprise, instead use this opportunity to evoke curiosity and anticipation by letting them know a perishable package is in route to them. We include extra dry ice in every package but the ice cream needs to be placed in a freezer immediately upon arrival. All packages are marked “Keep Frozen” and “perishable”. The Ice Cream Club® is not responsible for damage to unclaimed gifts. The purchaser is responsible to ensure recipients are available on the delivery date. You also have the option of purchasing a gift certificate. The recipient will receive a beautiful linen gift certificate allowing them to make their own pint selection. In addition, they will choose the timing that works best for them to receive the package. All shipments are based on the ship to address and will leave our plant on Mondays or Tuesdays. Shippers do not deliver on Sundays. You will receive an email confirming your order and subsequently receive an email with tracking information after your order ships. WHEN CAN I EXPECT MY ORDER TO ARRIVE AND WHAT IS THE COST TO SHIP? IS THERE ANY WAY TO GET MY ORDER QUICKER? Yes, but additional shipping fees will apply. Call 1-800-535-7711 ext 200 for details. WHY ARE CERTAIN LOCATIONS UNAVAILABLE FOR DELIVERY AND WHY DON’T YOU SHIP OUTSIDE THE U.S.? Ice cream is a very perishable product and current methods of shipping available to certain locations take too long and the ice cream would melt. In addition, shipping via air is cost prohibitive. We do not accept return packages because the ice cream will melt. If we have made a mistake, please contact us at 1-800-535-7711 ext 200; we are more than happy to correct it. ARE YOUR PRODUCT “ALL NATURAL”? There is no FDA definition of all natural (or minimally processed). There are ingredients generally considered all natural and most of our ingredients are generally considered all natural. However, as far as the emulsification and stabilization of the base ice cream mix goes, we do not use egg yolks or soy lecithin. Emulsifiers and stabilizers make up less than 1% of the product and are needed to bind milk-fat and water in order to have a smooth texture and prevent ice crystals. Egg yolks and soy lecithin are considered all natural but they are also allergens. By choice, we use vegetable derived mono and diglycerides, guar gum and carageenan. Guar and carageenan are minimally processed/all natural while vegetable based mono and diglycerides are further processed in order to make this vegetable derived emulsifier offer superior functionality. When it comes to all the inclusions in our flavors we utilize numerous ingredients. These range from extracts, nuts, fruits, baked goods, candy pieces, candy bars, chocolates, caramels, etc. Some flavors contain artificial colors or flavors. That is why we provide a detailed ingredient listing, allergen statement and nutritional facts for each flavor. If you have any questions regarding an ingredient, please contact our Quality Control Director. 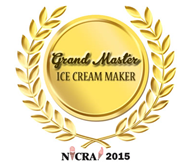 We have been making our award winning ice cream since 1982. All of our products are made in our 18,000 sq foot plant in Boynton Beach, Florida utilizing the Best cream in Florida. We have received numerous awards for our plant and our great tasting products. In addition, our cream which is rBST free (no artificial hormones), comes from a self-sufficient Florida Dairy which utilizes modern equipment to develop and maintain a complete environmentally-sensitive circle in the use of its water, waste and food. We also attribute the great taste of our products to the fact that over 2/3 of all the ingredients utilized to make our award winning products are locally sourced. We pasteurize and homogenize on premise. DOES YOUR ICE CREAM CONTAIN PRESERVATIVES? Our base mix does not contain preservatives. Preservatives are not allowed as part of the standard of identity governing the production of ice cream nor would any chemical preservative provide a functional benefit. Some of the inclusions contain preservatives, like candy bars, baked goods, etc. and they are listed in the ingredient statement. Does your product contain Artificial Growth Hormones? Our base is made with milk and cream from cows not treated with artificial growth hormones. Some of the inclusions added to the ice cream may contain artificial growth hormones. DOES YOUR ICE CREAM CONTAIN WHEAT GLUTEN? Our ice cream base and yogurt base is wheat gluten FREE. However, certain inclusions in the ice cream can contain wheat gluten, particularly those flavors with pieces of fresh cake, brownies and some candies. Please click on Wheat Gluten free flavors link to select from over 135 wheat gluten free flavors available. IS YOUR ICE CREAM KOSHER? Yes, all of the products produced by The Ice Cream Club® are certified Kosher. WHAT STEPS DO YOU TAKE TO MAKE YOUR PRODUCT SAFE IN TODAY’S WORLD? Our facility is inspected by the Food and Drug Administration (FDA) and the Florida Department of Agriculture, Dairy Division who regularly tests our products and calibrates our equipment. All products produced by The Ice Cream Club® are certified Kosher by the Orthodox Rabbinical Board. » Our ingredient suppliers meet the highest quality and food safety standards. » Incoming supplies are monitored for compliance with our specifications. » Finished product test results meet and exceed quality and safety standards. » Our employees are well trained in current good manufacturing practices and sanitation procedures. » Our production facility complies with the food code. » An allergen control program is in place and followed by all employees. » There is a record keeping procedure for product traceability from initial supplier to end consumer for the sole purpose of quality assurance and food safety. » Nutritional information is available. » Sensory evaluation is performed on finished products to ensure consistency and great taste. » Our company maintains a food safety plan that complies with the new FDA law known as the Food Safety and Modernization Act. The Ice Cream Club® and our Quality Control Division are committed to our Quality Assurance Program. Our focus is to provide and ensure consumers quality, safe, consistent and great tasting product. The Ice Cream Club® is dedicated to quality! WHERE ARE THE ICE CREAM CLUB® PRODUCTS MADE? We have been making our award winning products for over 35 years. All of the products produced by The Ice Cream Club® have been and continue to be Made in America. Our 18,000 sq ft plant is located in Boynton Beach, Florida and over 2/3 of all the ingredients utilized to make our award winning products are locally sourced. We have been awarded Fresh From Florida® certification. WHY HAVE I NOT HEARD OF THE ICE CREAM CLUB®? While we have been making our award winning ice cream since 1982, until now, we only produced 3 gallon tubs. Our original store in a town called Manalapan, Florida (adjacent to Palm Beach, Florida) is our only retail location. We do not have any sales people on the streets so our growth has been through word of mouth. Since we started in 1982 with a single ice cream shop, The Ice Cream Club®, Inc. has steadily grown to become the leading regional manufacturer and distributor of premium parlor style ice cream, yogurt and related products in the Southeastern U.S. The Ice Cream Club®, Inc. distributes ice cream and mixes to over 550 Ice Cream Shops, Retirement Communities, Restaurants, Food Service Accounts and Wholesale Accounts throughout the Southeastern and Midatlantic U.S. and Caribbean Islands. In order to ensure the success of long term customers, the Company’s award winning products are only found in select ice cream dipping stores and food service accounts, not in grocery or convenience stores, or discount warehouses. The secret to the Company’s success is the unbeatable taste of our Artisanal Style Ice Cream and Yogurt. In addition, the Company has become synonymous for large quantities of oversized inclusions throughout the Ice Cream Club® line along with many creative and unique flavors. The Ice Cream Club® holds true to the old-fashioned way of producing ice cream. This process takes longer and is less automated, but the taste of the ice cream definitely makes it worth it! We lead the chart in number of flavors available. We are very proud of the quality, variety and exceptional taste of our No Sugar Added Ice Cream Reduced Fat line. The Company maintains a Dairy Laboratory on premise. There has been uninterrupted continuity of ownership/management since inception. The Ice Cream Club® prides itself on its long term employees, customers and suppliers. In addition The Ice Cream Club®, Inc. maintains a strong commitment to the community, donating time, resources and products to numerous charities and scholastic enhancement programs. WHAT DOES IT MEAN THAT THE HARD PACKED YOGURT IS PROBIOTIC? In addition to the traditional yogurt cultures S. Thermophilus and L. Bulgaricus we have also added probiotic cultures of L. Acidophilus, well known for its health benefits. We use a process called Cold Inoculation. Unlike fermentation, where L. Acidophilus does not fare well in competition with the other yogurt cultures, cold inoculation assures high numbers of L. Acidophilus in the finished product. Many EXPERTS AGREE, when making probiotic frozen desserts, cold inoculation is the preferred approach. WHAT IS THE ICE CREAM CLUB® POSITION ON SUSTAINABILITY? In addition, we partner with suppliers that share our commitment to the environment. Our cream comes from a self-sufficient Florida dairy which utilizes modern equipment to develop and maintain a complete environmentally-sensitive circle in the use of its water, waste and food. The dairy has built in every possible environmental aid to make it not only efficient, well run organization, but a good neighbor and outstanding citizen with good stewardship practices in a time which the environment has become an extremely critical issue. HOW DOES THE ICE CREAM CLUB® GIVE BACK TO THE COMMUNITY? The Ice Cream Club® is civic minded with contributions of time, product and resources in support of numerous charities and scholastic enhancement programs, including Hospice by the Sea, March of Dimes, Alzheimer’s Association, Diabetes Association, Department of Children and Families (previously named Corporation of the Year), Boynton Beach High School Career Experience Program, Wellington High School Project Graduation, Forest Hills High School Project Graduation, Children’s Services of Palm Beach, United Cerebral Palsy, Palm Beach Police National Night Against Crime, Special Olympics Florida, and Project Lifesaver of Palm Beach County, etc. The Ice Cream Club® remains committed to lending a voice to the many issues affecting small business. Richard D. Draper, CEO & Co-Founder of The Ice Cream Club®, was invited to testify at a hearing of the Committee on Small Business of the U.S. House of Representatives in regards to the affects of regulations on small business. In addition, The Ice Cream Club® is actively involved in the International Dairy Foods Association, All Star Dairy Association, National Ice Cream Retailers Association, Florida Restaurant and Lodging Association and Localecopia. WHY AFTER 33 YEARS ARE YOU OFFERING THE ICE CREAM CLUB® PRODUCTS ONLINE? Over our 33 year history, all of our growth has been the result of customer demand. Even though our products are sold wholesale to independent ice cream shops, (customer) consumers have learned to recognize our unique and creative artisanal ice cream. We receive numerous emails requests for our products from consumers who tasted our products while traveling throughout the Southeast U.S. and want to locate and enjoy our products at home. In order to satisfy these consumers we are venturing into selling our ice cream pints online. Our ongoing success is the result of the contributions from our awesome team of long term employees, our long term vendors and the loyalty and support of our customers! We hope you enjoy our products! The Ice Cream Club has adopted strict security procedures and policies to assure that all customer data is protected. Please click on the link below to view our Security Policy. The Ice Cream Club®, Inc. is committed to protecting your privacy. Our Website does not request or collect any personal information from you other than what you provide. This site may collect certain anonymous information about your visit, such as the name of the Internet service provider and the Internet Protocol (IP) address through which you access the Internet; the date and time you access the site; the pages that you access while at the site and the Internet address of the Website from which you linked directly to our site. This information is used to help improve the site, analyze trends, and administer the site.